Do you ever amaze yourself? So first of all, I need to apologize to my followers...alll 24 of you. ;) I've fallen off the crafty wagon and I can't seem to get back on. I decided tonight to share more of the Project 30 cards I created to atleast get back into blogging. This first card is what inspired today's post title. I amazed myself with this card. I think it's publish worthy, but don't even know where to submit it. I just love how it turned out. This amazing Tim Holtz stamp set called to me at my LSS. I used an oval Nestie and then stamped the pop corn image. I used Copics to color the entire popcorn image and the tickets, which were then hand cut. 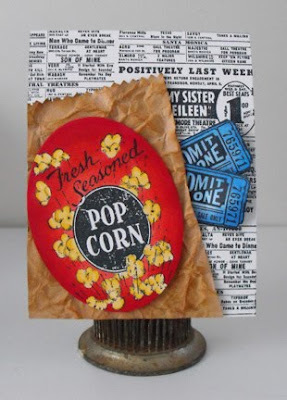 The popcorn bag is just a piece of tag cardstock distressed with two different inks, crumple and edged with pinking shears. Have you amazed yourself lately? I'd love to hear about it! Tonight we gathered at Melis's to make our entries for today's Papertrey Blog Hop. It has been lots of fun. Now we are frantically trying to all use one computer and get our cards posted, so this will be quick. 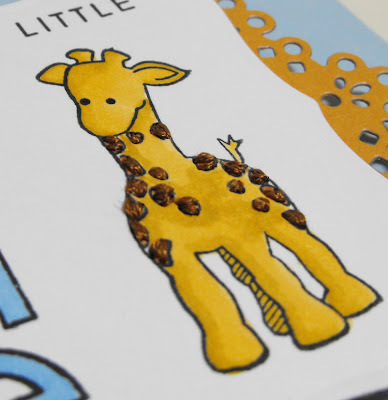 I have a baby shower on sunday and the wrapping paper has a cute Noah's Ark theme so I thought this little giraff (Fiskars) was just purfect! 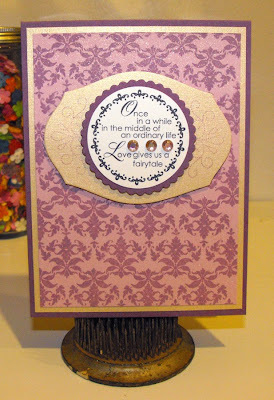 I've also used the Polka Dot Basics impression plate, Doily Details dies, & Baby Button Bits. Here's a close up of my embroidery thread use. It added some great texture! Thanks for the challenge PTI! Yesterday's challenge was to "think big"! Here's a couple little "numbers" (wink) for ya. The qualify as "big" for two reasons the use of the large numbers and the monumental birthday that they are for!! It's late enough that I think I can let the cat out of the bag. My baby brother turns 30 on 2/13. 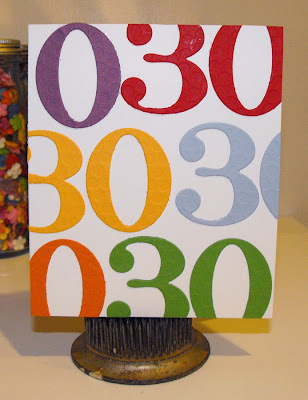 So what better way to celebrate than to receive 30 birthday cards from his big sis! That's my Project 30! I thought it was such a fun and unique idea-the whole family got involved. I've posted several of the cards already and will trickle the rest in over the next week or so. Let me tell ya, there are some dosies! 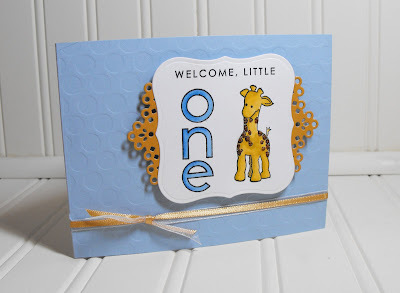 This first card came from the idea that Nichole used here during the January release of By the Numbers dies and stamps. 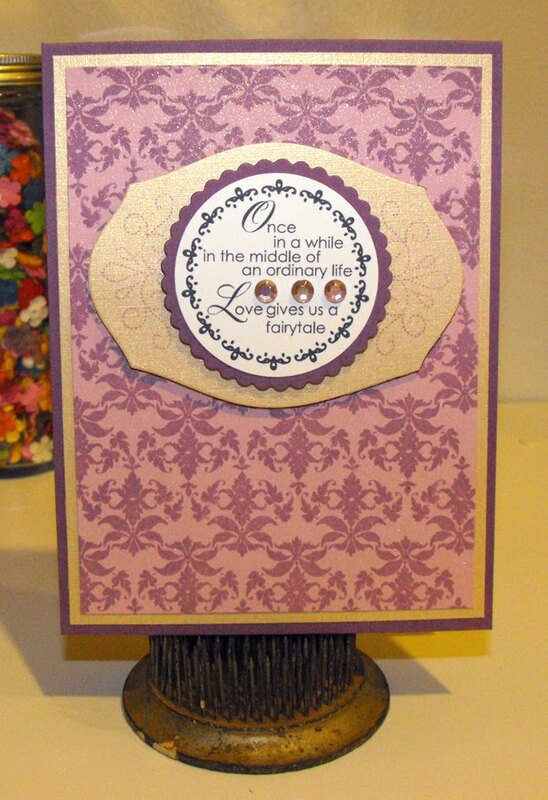 Here is used just the dies to cut out 30's after i used the Polka Dot Basics II impression plate. I then ran the numbers through my Xyron and voila! I LOVE how this turned out!! For the next card, I used By the Numbers again, but this time gave it a more vintage/retro look. 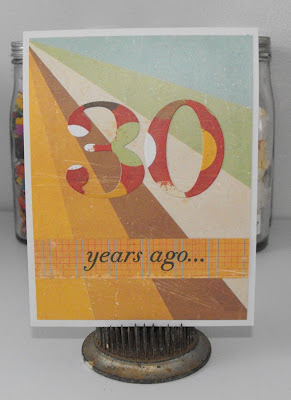 Cause ya know when someone turns thirty.... they're now vintage! LOL! Here's a couple more cards using this weeks freebies from PTI. The first is a pinwheel tag by Maile. The pinwheel just evokes a childhood whimsy for me. When I come across one in the store, I can't help but pick it up and give it a go! (**Note this card is also part of Project 30. ;) wink**) Although it's not too clear in the photo, I embossed the card base with Tin Types impression plate. I layered Maile's tag with a Berry Sorbet Nestie Petite Scalloped Cirlce on top of MatStack 3 - one of my new fav layers! It's all topped off with some lavendar twine one of my crafty BFFs, Alicia, shared with me. 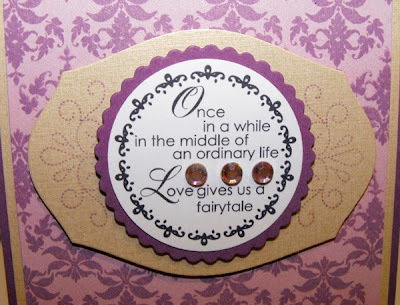 Next up is a romantic card based on Beth's tag. I went to my stash of left over background paper and came across one of my favs - a Plum Pudding Damask background stamped on Lavendar Moon paper covered in a golden shimmery ink mist. This was all matted with a perfect gold lined cardstock. 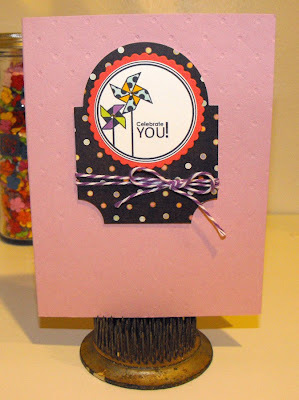 I also pulled out Matstack 1 and stamped the large image from Round & Round; I just love the dotted line scroll work! Finally it's topped off with Beth's tag layerd on top of a Nestie Petite Scalloped Circle and 3 gems. Thanks for stopping by! I love creating cards, scrapbook pages and hand made gifts; it is my stress relief! I am a working mother, have two great kids & am married to the best husband! Thanks for stopping by. I hope you enjoy!